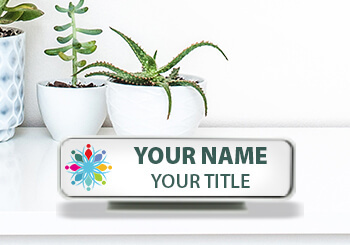 Office Name Plates | Cubicle & Wall Plaques Fully Customized! CustomSigns.com offers a full line of professional office name plates for doors, cubicles and walls. 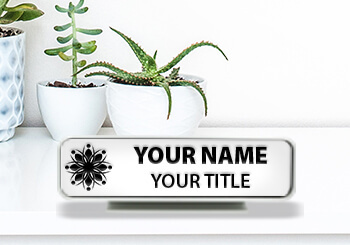 Shop custom desk plates and wall plates to help connect names and faces within your workplace. 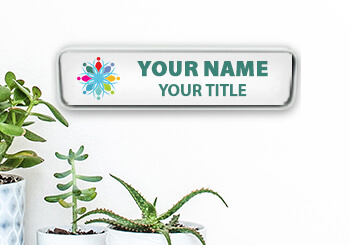 We offer professional customization of wall and door name plates featuring both full color plates and engraved plates. 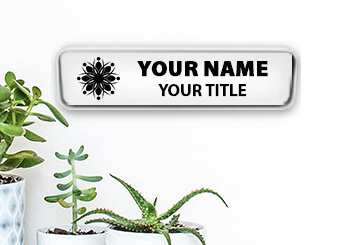 Find metal and plastic styles within our office name plates. 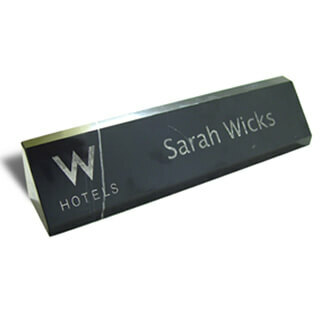 Our most popular style is the plastic name plate with metal holder. The custom process you choose will depend on whether you want 2 color or full color plates. 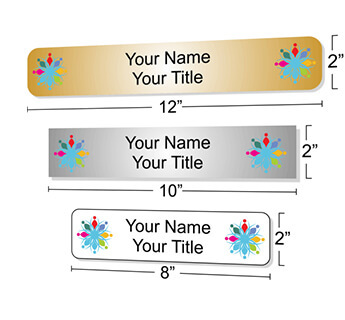 Our engraved name plates are only offered in 2 colors. We can engrave names and logos on desk plates and wall plates, but be aware that your logo will be converted to black and white, and then engraved into the color plastic that you choose. We have many color choices in our engraved plastic material. If you would like your name and logo to show in full color, we can full color print or sublimate ANY colors you need. UV printing is an overlay of ink on top of the plate, while sublimation is a heat process that leaves the surface smooth to the touch. We offer special plastics and metals that can be sublimated to your precise color specifications. 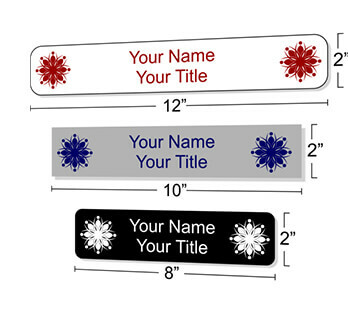 See our process page if you need more information on how we customize your name plates. Many customers are not sure whether they should choose wall mounted plates or desk plates. We also offer a selection of custom door signs and sliding signs. The decision on which type of name plaques to choose often relies on corporate or branding guidelines for cohesive employee identification, including name plates and badges. However, some key advantages of each type of plate are as follows.